Mughal empire in India is often thought of as a more benign, tolerant and inclusive Islamic Sultanate in Indian history, an impression left especially when one reads the ‘mainstreamized’ Indian history which is often little more than dilution and appropriation of an unprecedented story of a great nation’s struggle for independence into a modern idea of secular India. I personally opine secularism, in its true essence is not exactly a bane for a democracy like India. But trying to achieve it by making little of the sacrifices, sufferings and struggles of Hindus’ ancestors by tailoring history strictly to serve the purposes of secularist propaganda is not only futile, but self-defeating in the sense that it is very easy for a serious student of history to see through the secular narrative once he begins to directly refer to the contemporary Muslim sources of medieval India thus discrediting mainstream scholarships in studies of medieval Indian history. Though I do find some merit in the narrative of Mughal state being more tolerant than previous Arab, Turkic and Afghan dynasties, I, by the device of this article hope to challenge the idea of this narrative being entirely or generally true while simultaneously establishing the significant role played by Mughal state in the long run phenomenon of Hindu holocaust. Although there are many aspects of a regime to look upon and evaluate against, this article is going to be a lot centered around the military dealings of Mughal Sultanate especially with non Muslims, primarily Hindu subjects. After Babar’s conquest of Lodi dynasty of Delhi sultanate and Maharana Sanga, in the cold winter of 1528-29, Hindu Mandahars offered stiff challenge to him near Delhi. They even defeated Babur’s forces to the number of 3,000 men, upon which a larger force of 4,000 cavalry and several elephants was sent against them. Mandahar settlement was razed to the ground. Babur chose 20 of the captured Hindu women; rest he distributed among his companions. According to Ahmed Yadgar, “male Mandahars were half buried in the ground and were shot to death with arrows”. According To Abul Fazl, in 1562 Akbar forbade Mughal troops to keep or sell the wives, children and other relatives of the conquered people, Hindus. But it was never enforced(1), or was non-enforceable because it was the Mughal nobility, not the emperor who took lion’s share of Mughal Islamic state’s enslavement, deportation and even extermination policies (Kolff, 1990) especially so considering Mughal sovereignty a ‘corporate kingship’ in which all the nobles were ‘members’ rather than servants(2) who, to put it crudely, came together to conquer and distribute among themselves the spoils. During the 1620s and 1630s, a prominent role in this respect was played by Abdullah Khan Firoz Jang, an immigrant from Uzbek Amir. It is reported that in 1619-20, Abdullah Khan defeated all the hitherto unsubdued Rajas and ‘rebels’ of the Kalpi-Kanauj area (Fazl, pp. 195-96) he had been given to rule. 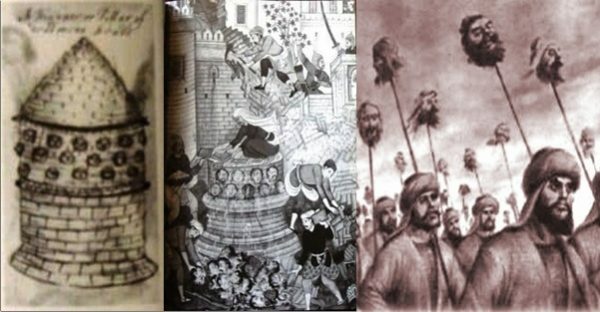 All the principal men folk were beheaded, while the Hindu peasants’ women, daughters and children, to the number of 2,00,000 were at Khan’s instance, transported to Iran and sold there (3) (Pelsaert)(4,5). Peter Mundy, an English traveler, who traveled from Agra to Patna in 1632, saw 200 minars or pillars on which a total of about 7,000 heads were fixed with mortar, during the 4 days of his passage through this area. This, Mundy reports to be the exploits of Abdullah Khan and a Mughal force of 12,000 horse and 20,000 foot, in Mundy’s own words, “whoe destroyed all their townes, tooke all their goods, their wives and children for slaves, and the chiefest of their men , causeing their heads to be cut off and to be immortered”. On his way back from Patna to Agra four months later, Mundy noticed that meanwhile another 60 minars with 2,100 to 2,400 heads had been added and that the erections of new ones had not yet stopped(6). For Abdullah Khan, it was regular practice (Kolff, 1990). Upon being asked once by a visitor how many infidel heads he had caused to cut off, he was reported to have said, “there would be 2,00,000 heads so that there might be two rows of heads from Agra to Patna”. Those conscious-stricken Muslims who dared to question very politely, his brutal methods on the grounds there might have been one or two innocent Muslims among these infidels, Khan shut them up by answering angrily as early in his brutal career as 1627 that, “I’ve made prisoners of five lacs of women and men and sold them. They all became Muhammadans. From their progeny, there would be krors (of muslims) by the judgement day (Samsam-ud-daula)(7). This man, Abdullah Khan, styled ‘Firoz Jung’ by Mughal throne for his services, went on to become one of the most celebrated Mughal generals, leading one brutal campaign after another(9), right till siege of Bijapur under Aurangzeb. Sometime around in 1638, Khan was faced by rebellion of Ujjainiya Rajput chief Rudra Pratap in his capacity as governor of Bihar. After 6 desperate months, Rudra Pratap thought of surrender(10). In hope of being pardoned, he came out of the forttress with his family. But Shahjahan ordered Rudra Pratap to be put to death; Abdullah Khan then made Pratap’s wife a Muslim and married her to his grandson (Hasan) (11,12). (13,14,15)Pratap’s estates were confiscated and put under the management of an imperial agent. It was only in 1656 that a descendant was given back the estates on condition of accepting Islam (Askari). Talking about Mughal generals, one of the many ‘worthy men of Islam’(16) was Husain Khan ‘Tukria’; Tukria being a title he received for making Hindus wear patches or ‘tukras’ for identification when he served as Governor of Lahore during Akbar’s reign(17), much like yellow David stars Jews were made to wear for easy identification by Hitler’s Nazi regime. Forced migrations was a deliberate Mughal policy in North India. Great number of people were moved across the Indus both ways, into and from central Asia . Whereas Hindu Rajputs in western Hindustan were exterminated and deported as slaves beyond the Indus into central Asia, Afghans were deported to the east and settled in areas notorious for Hindu Rajput turbulence. The Dilzak Afghans, for example, completely disappeared from their native land not only as a result of intensive military enrollment opportunities in India offered by Mughal and other Deccani Sultanates, but also because Jahangir deliberately deported a large number of them and ‘distributed them all over Hindustan and the Deccan’ to quell further rebellions in Mughal-held Afghan territories. Afghans were especially in demand to deal with the uncompromising Rajputs. During Shahjahan’s reign, Bahadur Khan Rohilla, an Afghan commander who succeeded Abdullah Khan as Mughal jagirdar of Kalpi and Kanauj, brought a caravan of 9,000 Afghans to populate all the ’52 mohallas’ of the newly founded city of Shahjahanpur (Joshi, 1985, pp. 15,16,105,110,128-9,167) Afghans played a crucial role in what Dutch Historian Dirk Kolff calls ‘partially successful Mughal attempt at the de-Rajputization of western Hindustan’ (Kolff, 1990), the reason why I believe, there are very few Hindu Rajputs left in northern plains of Punjab. Apparently, Rajputs paid a heavy price for trying to beat back foreign rule, its concomitant slavery and indignities. It was a fate, not necessarily limited to the rebel Hindu community, but to any one (especially a Hindu) in the rebel area, a case in point being the mass murder and enslavement inflicted upon Hindu peasants in the previously mentioned case of Chauhan Rajput rebellion in Kanauj-Kalpi area, merely because they were suspected of having supported their Rajput brethren. Another famous example of Turkic policy of indiscriminate slaughter of conquered people can be seen in the famous Seige of Chittor (1568) by Akbar, where when the fort defended by 8,000 Rajputs was carried, 40,000 non-combatant Hindu civilians residing inside the fort were massacred and enslaved. Abul Fazl defends Akbar in Akbarnama by accusing the Hindu priests, peasants and traders of Chittor of ‘showing great zeal and activity’ to help the defenders, a Mughal suspicion turned into solid belief merely because it took longer for the fort to fall than what Akbar had expected (Fazl). This action of Akbar can be fairly contrasted to that of acclaimed Turkic marauder, Alauddin Khilji who had at least spared the non-Rajput Hindus in Chittor fort as it fell to him. Akbar’s conquests greatly fed the slave trade to central Asia where horses were exchanged for Indian slaves. According to Monserrate (who travelled from Lahore to Kabul in 1581), a saying ‘slaves from India, horses from Parthia’ was current among the slave traders. Taking a cue from the above saying, Historian Dirk Kolff argues, if trade in slaves was as brisk as trade in horses, then thousands of people must have left India as slaves. In these deportations, Jahangir too had his share. William Finch, who was in India between 1608 and 1611 reports about Emperor’s hunting expeditions around Agra, usually from November to the end of March. Finch writes, “He causeth with choise men, a certain wood or desart to be incircled, so contracting themselves till they meet againe; and whatsoever is taken in this inclosure is called the King’s shikar or game, whether men or beasts, and whatsoever lets ought escape without the king’s mercy must lose his life. The beasts taken, if man’s meat, are sold and the money given to poore [a very convenient infidel source for the emperor to pay his ‘zakat’(18), it appears to me]; if mean, they remain the King’s slaves, which he yearly sends to Cabul to barter for horse and dogs; these being poore, miserable, thievish people that live in woods and desarts, little differing from beasts”(19,20). A careful reading of Mughal history reveals that the extermination policies adopted towards Hindu rebels almost never saw many Hindu communities joining hands together to oust the oppressive Sultanate. To put it crudely, everyone got butchered, raped and enslaved, but one-by-one, in isolation which never really made it too difficult for Mughal commanders like Abdullah Khan or Adham Khan Koka to slaughter and suppress them. Take for example, the case of Jats of Agra region, who were treated on several different occasions with similar barbaric methods. In January 1624 Jahangir wrote in his memoirs that he sent a force against ‘the villagers and cultivators’(ganwaran u muzarian), an oblique reference to brave Jat rebels. In 1634, 10,000 of Hindu Jat men were killed and their women and children ‘beyond computation’ were seized (Tuzuk-i-Jahangiri, p. 285)(21). The most eloquent witness is Jahangir himself. Towards the end of 1619, Jahangir sent Abdullah Khan to quell the insurgency in the Kanauj area which I have already mentioned. There was some hard fighting before the Hindu fort was captured by the Turkic imperialists, 30,000 of the Hindu rebels being killed. The cap or ‘tiara’ of the Hindu chief, containing jewels worth 20 lakhs of rupees and 10,000 of the heads of the rebels, fixed on spears, were brought to the emperor’s presence, prompting him to reflect philosophically on this slaughter in his memoirs (Kolff, 1990). Under Aurangzeb, Francois Bernier relates an incident when Aurangzeb disallowed a Persian ambassador from taking Indian slaves back with him to Iran(22). As of military operations, Aurangzeb’s reign saw a huge dent inflicted upon Hindu population by Mughal sword, whether be it Mughal military operations in Rajputana, Mathura, modern-day Haryana, or Maratha territory. Especially bloody for Hindu civilians was his campaign against unrelenting Marathas (led first by Shivaji and then his illustrious son, Shambhaji) which saw around 2 million deaths due to Mughal depradations, drought, plague and famine(24). There is irrefutable evidence of the enslavement and deportation of thousands and thousands of Hindu peasants by the Mughal aristocracy(25). As we can see, policies of violent repression, enslavement, intended extermination and repopulating the same Hindu districts with imported Muslims, adopted by Mughal state over its Hindu subjects hardly succeeded in completely obliterating Hindu populations but have certainly left a major demographic scar on India. High concentrations of Muslims in districts like Muzzaffarnagar, Saharanpur, Bareilly can thus be directly credited to Mughal state and its conscious attempt to effect a Hindu holocaust, necessitated in part by their need to cling on to power unchallenged and indefinitely along (by snatching the last advantage Hindus had, that of numbers) with fanatic religious beliefs often held dear by Islamic clergy at Mughal courts (who again began wielding considerable influence after Akbar and were at the height of their role as advisors to Mughal throne under Aurangzeb). By any definition, these acts of Mughal regime qualify as genocidal. Featured image courtesy: Delhi Magic– of towers and skulls by Deepa Krishnan and Google. (1)See Mughal enslavement of conquered people of Chittor(1568), a good 6 years after the purported ban, which seems to be intended to serve only propaganda purposes by creating a tolerant image of the new Timurid prince. Key Source: This article is majorly based on Dirk Kolff’s Naukar, Rajput and Sepoy: The Ethnohistory of the Military Labour Market of Hindustan, 1450-1850 (University of Cambridge, Oriental Publications). Note: A few lines or paragraphs have been reproduced verbatim from Kolff’s book. Sangraam S is a Nationalist. Justice for Hindus is all he asks for.